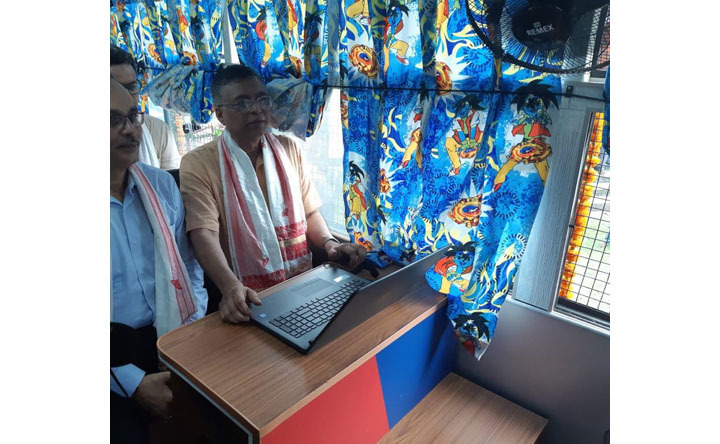 Assam Education Minister, Siddhartha Bhattacharya on Tuesday launched a mobile classroom, Computer Education on Wheels Program. It is an initiative of a Northeast-based cement company, to provide free computer education to students during school hours. The classroom is mainly a bus housing computers, chairs and tables, to create an interesting environment for learning. Students can avail digital tools like videos, audio clips, images, interactive graphics, hyperlinks apart from basic computer skills. Star Cement has taken the initiative to introduce the facility for Assamese medium students in the Sonapur area. The company said that in pursuit of continuous social development and support to education, it has pioneered the initiative for inclusive development of primary and ME school children in an innovative non-classroom environment. Instead of providing a computer classroom in one school, the company’s aim is to cover multiple schools with insufficient infrastructure to provide computer literacy to their students.